Turkey says it will continue to target U.S.-allied Kurdish fighters on the Syrian frontier near its border, despite mounting international pressure on the Ankara government to stop the artillery bombardments. Turkish Prime Minister Ahmet Davutoğlu, in telephone talks Sunday, told German Chancellor Angela Merkel that Turkish forces will "not permit" the Kurdish People's Protection Units fighters (YPG), of the Democratic Union Party (PYD) "to carry out aggressive acts." Both France and the United States have called for an "immediate halt" to the Turkish bombardments. YPG fighters, backed by the West and Gulf countries, have been battling for more than a week against a ferocious Russian-backed offensive by Syrian President Bashar al-Assad’s forces. However, the Ankara government sees the YPG as linked to an offshoot of Turkey's outlawed Kurdistan Workers' Party, the PKK, and considers both groups terrorist organizations. Davutoğlu earlier confirmed artillery strikes overnight Saturday and demanded the withdrawal of YPG fighters from the Syrian border town of Azaz. 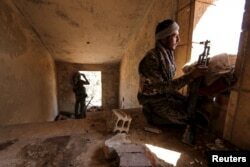 Ankara also demanded the Kurds vacate a nearby airbase seized last week from Syrian rebel forces. Rebel commanders say YPG fighters are now in parts of Azaz, just six kilometers from the border with Turkey. The Turkish shelling continued Sunday, with new fighting reported around the strategically important town of Tell Rifaat between Syrian rebels, Syrian government forces and Kurdish fighters. Amidst the shelling, the YPG claimed to have captured the village of Ayn Daqnah, east of Menagh and south of Azaz. According to Turkish military officials, the shelling of YPG positions came in retaliation for Kurdish gunfire, and was focused just southwest of Azaz. 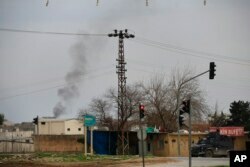 Rami Abdel Rahman, of the Syrian Observatory for Human Rights, a monitoring group, said Turkish shelling struck wider afield, targeting YPG positions near Menagh, the airbase the Kurds took from Syrian rebels. Later Sunday, Saudi Arabia confirmed it had sent aircraft to the NATO air base at Incirlik in Adana, near the Syrian border in southern Turkey, to step up operations against the Islamic State group in Syria. Turkish Foreign Minister Mevlut Çavuşoğlu had said Saturday that no decision had yet been made on a ground force against IS, which analysts say could dangerously widen the multi-factioned conflict and raise the specter of a Turkish clash with the Russians. Smoke billows from a fire at the southeastern town of Nusaybin, Turkey, near the border with Syria, where Turkish security forces are battling militants linked to the outlawed Kurdistan Workers, Party or PKK, Sunday, Feb. 14, 2016. Meantime, the Syrian regime has condemned Turkey's shelling of PYD-held areas inside Syrian territory, describing it as an attempt to raise the morale of "terrorist" groups.